Very early in my career, I started thinking about the people who will come after me. I think a lot about how I impact the environment in which I work. I care about leaving that environment better than I found it. I have been blessed by knowing all sorts of really great people who have made the environment better and they inspire me. Fitting in is hard. Even now in 2018, I found myself sometimes entering all white all male rooms or all baby-boomer rooms and it’s surreal for someone like me who entered a deeply feminized and increasingly millennial profession. In these positions I feel a great pressure to emulate women that came before me. I can feel the woman-shaped shadow that they have left. Sometimes I can fit into that shadow, sometimes I just can’t. It’s not other women’s fault that I am not them. The legacy left behind can feel as if difference is frozen in glass, like being in this space means you can only be a specific type of person or as a specific type of worker from specific time or place, because great incredible people who look like you were a specific type of person or from a specific type of place. When you are the first in an environment, the most important part is sometimes making sure that there is still a spot for those people who come after you. In these environments, I think the part where I can be my most effective is if I be my usual weird self. You know, the normal person that I am. With my sarcastic sense of humor. With my own bad handwriting. 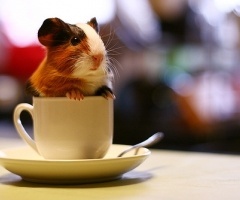 And my love of pictures of guinea pigs in cups. I think that being weird is the most responsible thing I can do. Because in the end, it’s the most I can do. I just try to bring my whole self to work, because I hope that if I am as much of my whole self as I can be, then I will encourage others to be themselves as well, or at least the best versions of themselves that they can bring to work. They won’t spend all their time trying to fit into the leader shaped shadows that others have left before them. This entry was posted in Dumb things I do, Thoughts on profession on March 5, 2018 by admin.